Reduce air conditioning costs during the summer and beautify and beautify your home exterior in the bargain, by adding fixed, retractable, or portable awnings to your windows. “People don’t realize that there are more eco-friendly ways to stay cool,” points out Byron Yonce, chairman of PAMA. “While turning up the air conditioner results in higher energy bills, awnings and shades work with the air conditioner to keep your home cooler and reduce the need for additional energy.” The American Society of Heating and Air Conditioning Engineers recommends that homeowners use “optimized and/or moveable external shading devices, such as overhangs, awnings, and side fins” to minimize a building’s heat load. A fabric awning reduces heat gain by 55% to 65%! 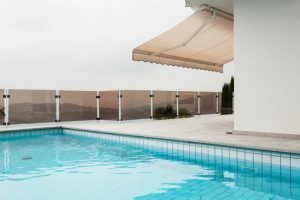 There are so many factors why awnings can benefit your home, it is a long term investment that not only saves you money but can also increase your home value. For more information about retractable awnings or awnings in general, get in touch and contact us at 210-691-9300 for a free consultation.